Espresso web library give you an Espresso-like feel to interacting with WebViews. From espresso 2.2 webview support module was added to the espresso lineup. Prerequisite - You must have used espresso for native UI test cases. otherwise some of the methods you don't know we have used in code. Some time in mobile application we open web pages inside our app for some of features like login or registration or various payment methods etc. 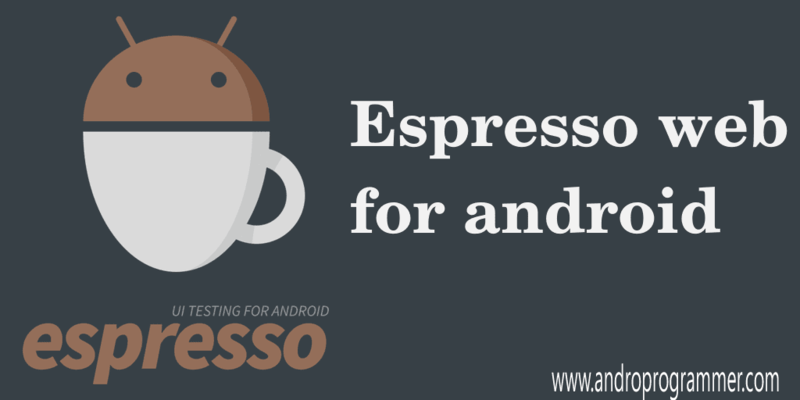 and those module required to test thoroughly so to do that espresso provide Espresso Web Api. There are many ways to identify HTML element to perform action on element like using its Id, Name, Tag ,XPath etc you can find more about in Locator class in espresso web library. In this tutorial I am going to write the most used Locators for writing test cases for web pages in android. You can also perform above test on the basis of element tag also. If you know element tag instead of its Id or have same id used for multiple elements. So as you can see we are testing particular label with "xyz" tag have "xyz" text. Some time you don't know Id or even element have no Tag defined but still we need to test particular label has given text or not. so espresso even support XPath of the element from HTML code. That's it from my side. Now run the app and see the result. If you have any query please let me know in below comment box.